US Marine Corps/SSgt. 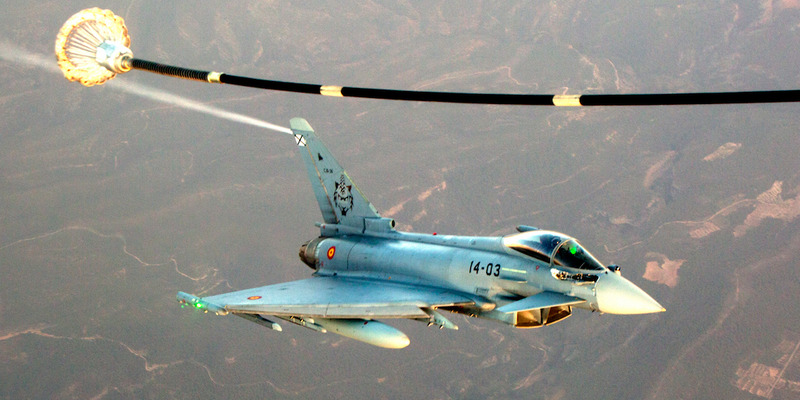 Kenneth K. Trotter Jr.A Spanish air force Eurofighter Typhoon trails a US Marine Corps KC-130J during air-to-air refuelling training near Morón air base in Spain on July 13, 2017. 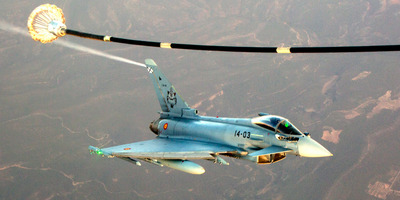 A Spanish fighter jet taking part in a NATO mission over the Baltics accidentally fired a missile in early August. The missile didn’t hit anything, but it was never recovered, and now Russia is sending a message about it. On August 7, a Spanish Eurofighter Typhoon fighter jet taking part in a Baltic air-policing mission accidentally fired an air-to-air missile as it returned from a training exercise over Estonia. The Spanish jet was based in Siauliai, in northern Lithuania, but the exercise, which included another Spanish jet and two French Mirage 2000 jets, took place over a training area in Estonia that is only about 60 miles from the border with Russia. The missile, which has a range of about 60 miles and carries a 50-pound high-explosive warhead, never acquired a target and flew off, reportedly bearing north. Its trajectory and final location were not known. Estonia halted NATO air exercises to conduct a search, but after 10 days of looking, the Estonian army was unable to recover the missile, which has a self-destruct feature, the Spanish newspaper El País reported in September. Now Russia’s foreign minister, Sergey Lavrov, has pointed to the incident as the kind of event that could escalate dangerously. In an interview with RT France, a Russian state-run media outlet,and reported by the state-owned outlet TASS, Lavrov said that almost all cooperation between Russia and NATO had been frozen. Telephone contacts between the chief of the Russian general staff, Gen. Valery Gerasimov, and NATO’s supreme allied commander in Europe, US Army Gen. Curtis Scaparrotti, were not enough to reduce the risk of unintended incidents escalating, Lavrov said. An official investigation found that the accidental launch was the result of human error, El País reported. The pilot who accidentally launched the missile, a veteran commander, was found responsible but received the minimum punishment, as the investigation determined he became distracted by whether the other Spanish pilot applied their safety measures and forgot to apply his own. When Spain’s Eurofighters conduct such exercises over Spanish territory, they use inert munitions, according to El País. However, NATO requires fighters taking part in Baltic air-policing missions to use live munitions. NATO has been running air-policing missions over the Baltic states since 2004, when those countries joined the alliance, to help protect their airspace. The Spanish contingent taking part arrived in Lithuania at the end of May with six fighters and 135 personnel. Their deployment ended on August 31.